I made these cookies (one dozen) as part of a "Giving the Gift of 'Thank You' Project" created by big-hearted Anita, of Sweet Hope Cookies, in remembrance of her brother, Randy, who died of ALS. 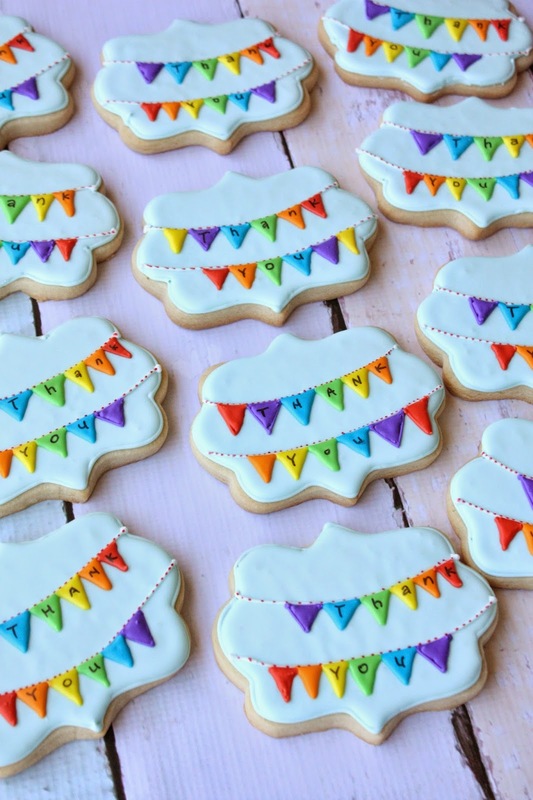 The colors of the rainbow and bunting are two of my favorite things, so combining them makes for one happy cookie in my book. I also like twine:) Hopefully you can tell the bunting is hanging from "twine". Thanks Anita, for all that you do for others, and giving me the opportunity to help out in some small way! 3. Bake according to recipe, or until starting to brown lightly on the edges. 6. Add a different gel color to each portion. 7. Outline the cookies with a #3 tip and the sky blue royal icing. 8. Fill the cookies with the sky blue royal icing. 9. Let the cookies dry for 6-8 hours or overnight. 10. Using a small tip (I used PME 1.5 tip) add the white "string" for the buntings and let it crust(dry). 11. Using the small tip, add each of the royal icing colored triangles to the cookies (I did all the purples, then blues, etc...). 12. Let the cookies dry 6-8 hours or overnight. 14. Use the black marker to add the letters for a message. These are SO GORGEOUS Sue. Honestly, what a lovely gift! These are great and the twine is the most perfect detail!! I love rainbows (I too think they're just so happy! ), buntings, and twine! No doubt, they'll brighten the caretakers' days. What a wonderful reason to cookie! P.S. Thanks for opening up your commenting options for me :) !! Stopping by from I'm Lovin' It Link Party. The detail is incredible! Thanks for sharing! These are absolutely adorable, I think I may just pin and share this. Thanks so much! Great job, Sue! These rainbow cookies are so cute and fun! Creative idea, as always! Your cookies are adorable. And what a great cause that you made them for! 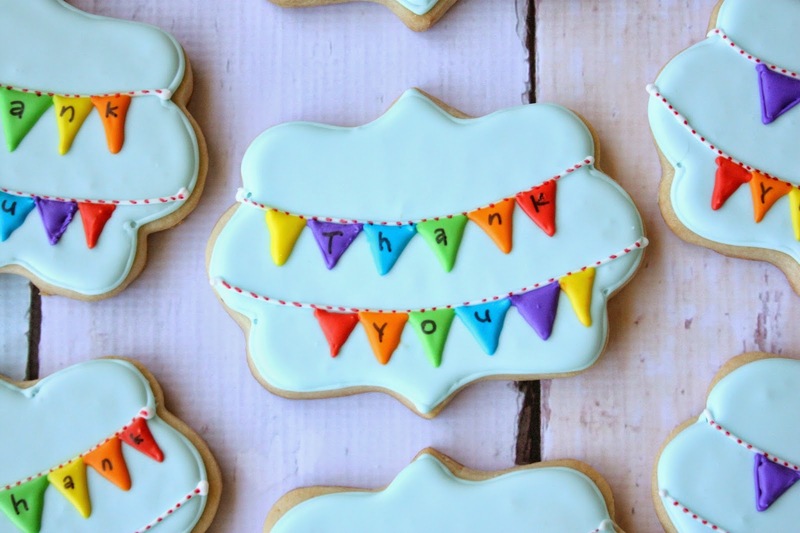 This is a sweet way to say “Thank you”- literally and figuratively speaking. Thank you for sharing your creative idea. 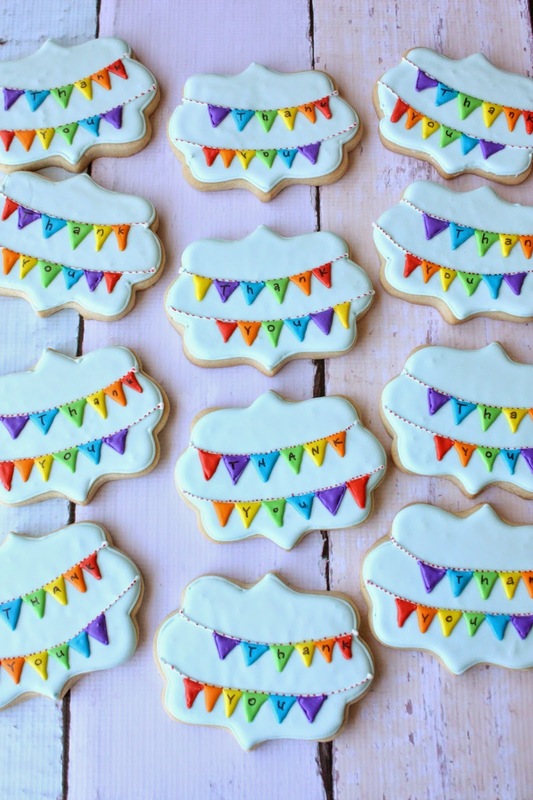 I love bunting cookies and these are so cute! I love the colors!